Sandstone is a sedimentary rock composed mainly of sand-sized minerals or rock grains. Most sandstone is composed of quartz and/or feldspar because these are the most common minerals in the Earth's crust. Like sand, sandstone may be any color, but the most common colors are tan, brown, yellow, red, gray and white. Various finishes to sandstone natural stone offer further depth and interest to the product, from a rustic riven top to a smooth contemporary product or even a weathered flagstone look. Furthermore the ability to stipulate random lengths (although always standard widths) of flagstones allow the finished area to shine with visual interest. 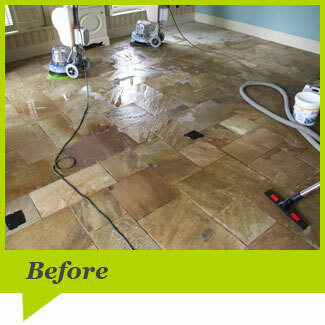 With improper cleaning and sealing the floor will, overtime lose its appearance. We have devised a systematic approach of cleaning and sealing to restore floor to its original appearance. 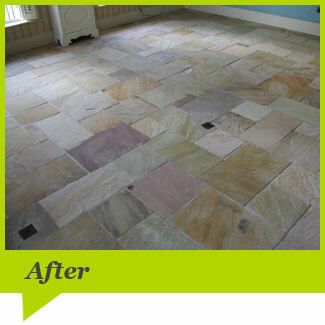 See below an example of a restored sandstone floor.